A ra ra styled tiered tutu, the UV Ruffle Tutu is available in hot pink or bright neon yellow and glows brightly under UV party light. Short, cheeky and perfect for fancy dress or club nights, these kooky tutu's have three layered tiers of uv reactive mesh and are fifteen inches long. The sateen finish elasticated waist will fit up to a maximum size 12. 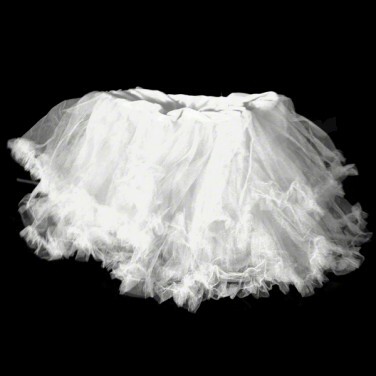 UV Ruffle Tutu - White Brighten up your look and stand out form the crowd in a cute and kooky UV Ruffle Tutu. You'll literally glow under UV blacklight! Use long UV fishnet gloves to add bold and funky colour to your forearms. UV reactive, these gloves will glow under UV or blacklight. A bright neon UV wig that glows under ultra violet party lighting. Cut in the style of an ever funky bob with fringe.